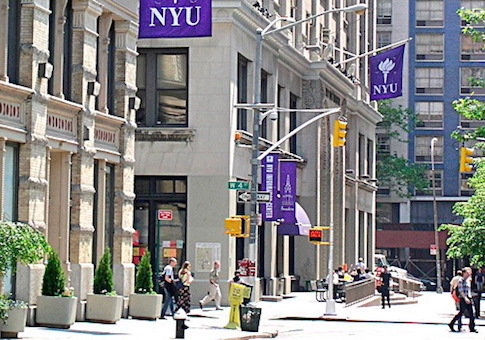 A New York University student-made handbook purporting to "demystify the systems of power behind our University" devoted a large portion of its content to the school's connections with Israel. In the 50-page "NYU Disorientation Guide"—which "focus[es] on the most destructive things NYU either perpetuates or is complicit with," according to the anonymous authors—Israel is mentioned 55 times. That's more than the number of references to "Trump," "alt-right," "racism," "fascism," "white supremacy," and "socialism" combined. "Despite the diversity of its content, this guide had a few broad themes that unite many of the articles: NYU behaving like a multi-national corporation and 21st century colonial power, entrenching white supremacy and hetero-patriarchy with institutionalized violence, and enslaving its students with backbreaking debt," reads the introduction. Of the "radical" campus groups highlighted, two—Students for Justice in Palestine and NYU Jewish Voice for Peace—are chapters of organizations dedicated to the elimination of Israel as a Jewish State. The International Socialist Organization notes its anti-Israel stance in its profile and the Democratic Socialists of America, also on the list, passed a pro-boycott, divestment, and sanctions resolution this summer. NYU is accused of having "myriad racist, Zionist, and homophobic policies" and its satellite campus in Tel Aviv is called one of the university's "imperial projects" through which it is guilty of "complicity in [Israel's] violence." The guide lobs the accusation that "students of Palestinian descent, or Arab descent more broadly, are distinctly prohibited from studying at the Tel Aviv site." Josh Taylor, associate vice chancellor of NYU's Global Programs, told the Washington Free Beacon there was absolutely no truth to the claim. No such policy was found on the Global Programs website. A section in the guide labeled "Displacement and Corporate Education" called Birthright, an organization that takes Jews 18-26 years old on free 10-day trips to Israel and is particularly popular with college students, "pure propaganda designed to obscure the destruction of Palestinian homes, lives, history, and culture." "To go on one of their ‘vacations' is to be complicit in the occupation, destruction, and colonization of Palestine," pronounces the guide, which also falsely claims the cultural history program was founded "with the hope of facilitating greater Jewish settlement of Israel-Palestine." A series of maps that have been widely discredited as misrepresenting the progression of the establishment of the State of Israel accompany this section. The guide also takes aim at the NYU College Republicans and their "family values, conservatism, evangelical Christianity, and ‘fiscal responsibility'." An email sent to the guide's creators was not responded to by press time. This entry was posted in Culture and tagged College Campuses, Israel, New York. Bookmark the permalink.